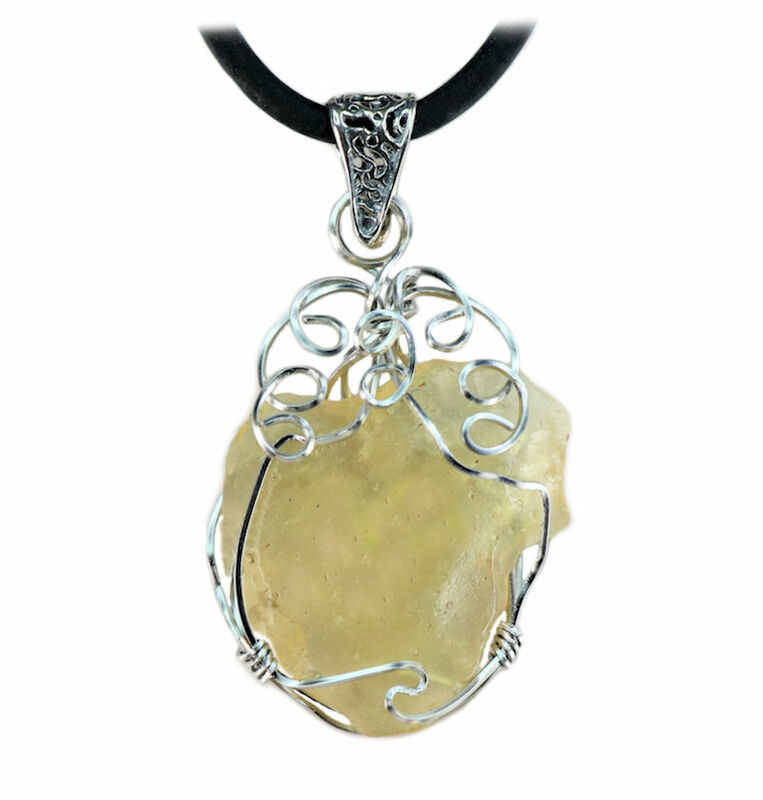 Authentic Libyan Desert Glass Jewelry Pendant Necklace Sterling Silver Libyan Desert glass is the ejected, melted and then cooled coalesced sand droplets that is the result of the action of an asteroid, comet, or meteorite space rock impacting the Libyan Desert. Scientists think that this impact occurred about 26 million years ago. Because of the impact the heavens rained backed to earth these all-natural shimmering droplets, only found in the Libyan Desert. They are the solitary remains that speak of a vanished era long ago when a space invader pummeled the now Libyan Desert. 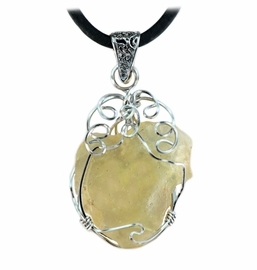 This beautiful and unique pendant necklace jewelry is professionally wire wrapped in sterling silver and accented with an exquisite sterling silver bail with matching chain. It is a historical reminder of the heated, tortured sand that was formed, and the resulting droplets is considered to be an exotic space jewelry gemstone. Size About: 2 1/4" L X 1 1/4" W X 1/4" D; 9 grams; Shipped with a 22" 1/8" thick black cord quality chain, Certificate of Authenticity, information and beautiful jewelry box! This is the perfect gift for the special someone in your life who enjoys astronomy, geology, or exotic jewelry. Cosmic, Awe-inspiring "Jewelry with a Story!"